An intriguing clash is expected as both sides hope to strengthen their promotion aspirations with the third-placed visitors making the trip along the coast to take on their fourth-placed hosts. The Hornets go into the clash having not played for over a week after Saturday's fixture at East Grinstead was postponed due to a waterlogged / unfit pitch. Hastings were in action on Saturday and manager Chris Agutter was left berating two dropped points as they were held to a 1-1 draw at The Pilot Field by Guernsey - even after having two players sent off in the second half. Victory for the home side tonight would see them pull to within a point of their visitors, who have hit a dip in form of late - winning just one of their last four matches, a run that included a shock 4-1 hammering at Herne Bay. Previously to two of that run being draws and the defeat, The Arrows had consolidated second place in the league and looked to be the only ones capable of pushing runaway leaders Cray Wanderers. The hosts will be without defender Lewis Hyde, who starts a three-match ban after his Ramsgate red card. Midfielder Charlie Harris is also out with cruciate ligament damage. 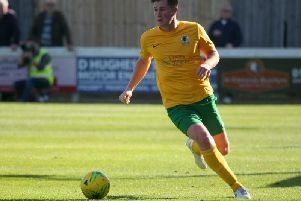 Former Worthing and Burgess Hill defender Will Miles is expected to make his debut.